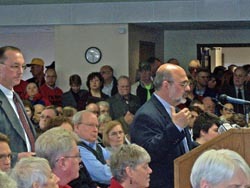 A crowd of over 300 people turned out Friday in Cambridge to voice their opinions about Governor Doyle&apos;s proposed state budget. During the last of the Joint Finance Committee&apos;s statewide budget hearings, Jefferson County Board Supervisor John Molinaro urged lawmakers to lift levy caps on local government. He says current caps make it difficult to keep up with rising labor and road maintenance costs without constantly dipping into reserves. Rock County Sheriff Bob Spoden testified in favor of an early prison release program for non-violent offenders, saying it would help manage rising inmate populations. He says the state will save money by letting inmates rejoin their communities, rather than continuing to build more prisons. Randy Meffert, a petroleum marketer from Waunakee, urged the budget committee to reject the governor&apos;s proposed tax on oil companies. He worries it will limit the supply of gas and oil coming into the state, warning companies may divert their products to other states. Dane County Executive Kathleen Falk asked the committee to expand a provision that allows for the creation of Regional Transit Authorities, saying the current version limits how taxes raised by RTAs can be spent. The current proposal only allows the money to spent on transit, but she wants the provision expanded to include road construction. Pardeeville School District Administrator Gus Knitt spoke against a budget proposal to require three years of math and science for high school students to graduate. Knitt says many of their students go on to tech colleges, which don&apos;t require the additional learning. He says the unfunded mandate would also require them to shift resources away from needed programs, such as vocational training. Lawmakers also heard testimony on a statewide smoking ban, education funding, and cuts to medical services. The hearing in Cambridge ends two weeks of public testimony across Wisconsin. The Joint Finance Committee will now begin work on revising the governor&apos;s budget proposal. Those changes are expected to be presented to the full Legislature later this month.